I really didn't plan on spending $5.97 on one heirloom tomato. I just grabbed one and tried to hide my shock at the checkout counter. However. 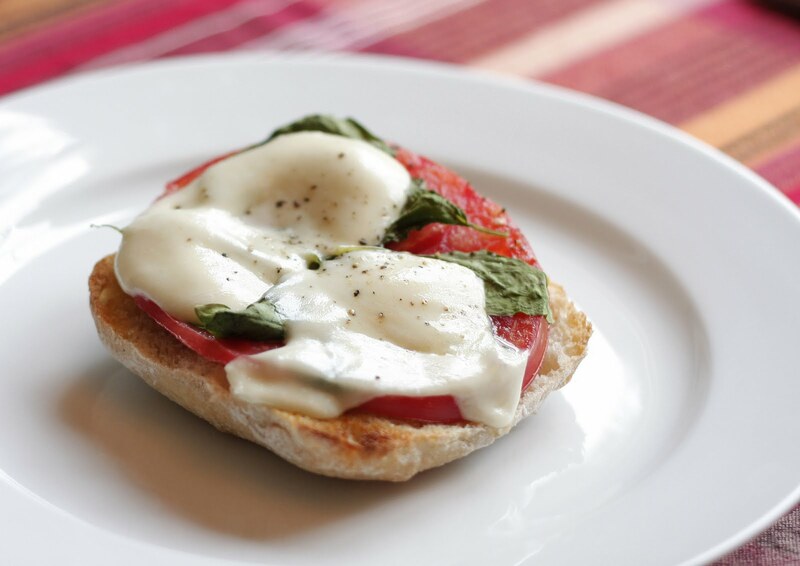 at least once a year, everyone should indulge in a ciabatta, tomato, basil and fresh mozzarella sandwich. At least that is my persuasion. It was so good I think my eyes rolled back into my head. Brush ciabatta bread with olive oil, fresh garlic and salt. Broil until toasted. Really needs to be a dense tough bread. A baguette would work well too. Broil until cheese is melted. Leave it open faced so as to not squish the tomato. Bask in the bliss of every bite. Congrats to my baby sister Molly who just announced she is pregnant with a little boy!!!! I would pay that for a *German Johnson* tomato! Nothing better!!! Sometimes it's the little things that make us happy! Note: if you don't like tomatoes (like me) a roasted red pepper is delicious, too. Yum, yum, yum. I had an heirloom tomato plant in my garden last year. I think the whole plant was less than $6. : ) Fresh basil and mozza and tomatoes are so, so good. That looks SO good. I'm a Vegetarian and am always looking for new yummy recipes! :) Thanks!